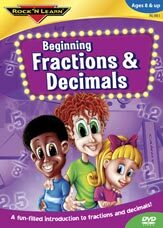 Beginning Fractions & Decimals DVD provides clearly illustrated examples to ensure that even difficult concepts are easy to grasp. Delayed answers give learners plenty of time to test their brand-new skills. Your kids will enjoy the comical characters Frances Fraction, Dennis Denominator, and Newman Numerator as they explore how fractions and decimals are used in real-world applications.